Single Mom's Search For Therapist Hampered By Insurance Companies : Shots - Health News Recent health laws were supposed to give people easier access to mental health care. But some adults who have anxiety or depression and need help are still having a tough time lining up treatment. Natalie Dunnege's son, Strazh, has autism. "He's really a good kid," Dunnege says, "But it's a lot to handle, especially as a single parent." A 12-year-old boy named Strazh hangs from the monkey bars, staring at the ground. The other kids in the park in San Francisco aren't interested in him. And he's not interested in them. "I just like to play by myself," he says. Strazh has autism. Today is a good day. But on most others, Strazh has meltdowns. Something frustrates him and he can't control his emotions. "I sometimes end up screaming," he says. "And I end up yelling and screaming." And hitting and banging things, throwing things, adds Strazh's mom, Natalie Dunnege. As a single parent, she bears the brunt of her son's outbursts, she says. "He told me that I disgusted him," she says softly. "He tells me he hates me." Dunnege puts all her spare money into therapy for Strazh. She says it helps a lot. But Dunnege herself is struggling, feeling depressed and overwhelmed. She decided to look for her own therapist. "One of the things that I've really had to wrap my head around is that I can't change him," she explains. "I can only change how I handle the situation. And not that I would want to change who he is. He's a really good kid. But it's a lot to handle, especially as a single parent." 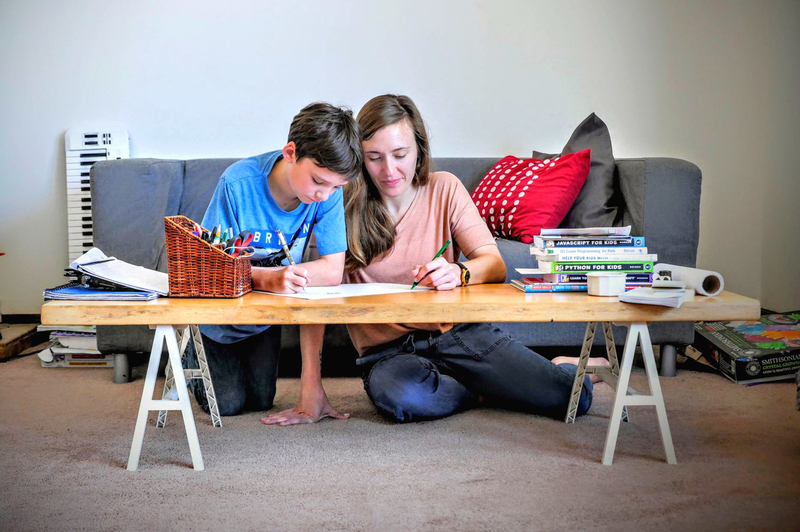 Natalie Dunnege and her son, Strazh, work on an art project at home in San Francisco. Her health insurance would cover therapy sessions to help with her depression, Dunnege says, but she hasn't been able to find a counselor who is taking new patients. Yet when Dunnege logged onto her insurance website, Anthem Blue Cross, to find a therapist, she realized her copay for a mental health visit was going to be upwards of $75 – even though her copay for other medical appointments was less. "There's no way," Dunnege says. "It's out of my budget right now." Dunnege lives in a one-bedroom apartment with her son and her father in San Francisco's Haight-Ashbury district. Dunnege says $75 a week for therapy is impossible, given her low income. "I just made lower-middle income," she says. "Just by the skin of my teeth. So I just have to hold off until I'm actually middle class." More than 43 million Americans suffer from depression, anxiety and other mental health conditions, according to the most recent federal data. But more than half the people who felt like they needed psychological help last year, never got it. Even people who had insurance complained of barriers to care. Some said they still couldn't afford it; some were embarrassed to ask for help. Others just couldn't get through the red tape. Recent federal health laws — the 2008 Mental Health Parity Act and the Affordable Care Act — were supposed to fix this. They require health plans to provide benefits for mental health conditions on par with physical health conditions. Under the law, insurance companies can't charge higher copays or set up separate deductibles for mental health care, compared to other medical or surgical care. They can't limit hospital stays or require preauthorization for mental health treatment unless the same limits are applied to treatment for physical health conditions. But the laws are complicated and many insurance companies have struggled to comply. In California, state regulators found that 24 of 25 insurance companies offered one or more plans that charged copays or co-insurance for mental health treatments that were higher than the copays or co-insurance required of other medical treatments, even though they are supposed to be the same. The state's department of managed health care is working with the plans to fix these unequal cost-sharing policies. 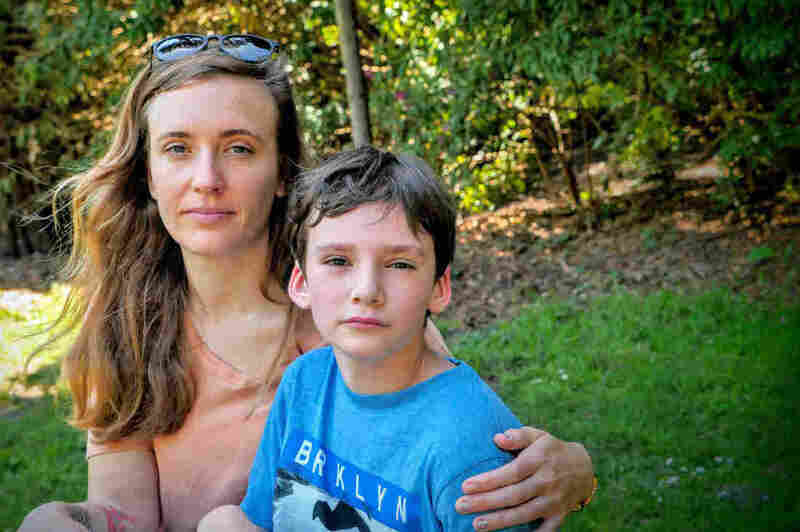 Anthem Blue Cross, Natalie Dunnege's plan, which charged a $75 copay for a mental health visit, is one of the insurers required to make fixes. In a statement, the company said it is working with regulators to comply with the mental health parity laws, and that it "is committed to providing access to high quality and affordable health care, including mental health care." But some insurance companies are still finding ways to keep people who need care from getting it — sometimes through subtle, technically legally, ways of limiting treatment, says Keith Humphreys, a psychiatry professor at Stanford. He served as an advisor to Congress when it was developing the 2008 Mental Health Parity Act. Natalie Dunnege encountered some of these barriers when she tried again to find a therapist. In the last year, she got a promotion at work and moved into a larger apartment. Now she has Blue Shield coverage, and her copay for a mental health appointment is only $20. "Which I was really excited about," Dunnege says. But when she looked for a therapist who would take her insurance, she struck out. "I contacted six or seven," she says. Only three called her back. One was completely booked, she says. "The other two just didn't accept the insurance anymore." Zero hits out of seven. To find out if this was consistent with other people's experience or just a bad draw, I decided to conduct my own survey and called all the psychologists — 100 in total — that were listed on the Blue Shield website for Dunnege's plan in San Francisco. Nearly a quarter of them never called back. Almost half said they weren't accepting new patients or weren't taking insurance anymore. That left 28 psychologists who actually had appointments. And only eight of them had slots available outside regular work hours. Eight out of 100. "Sorry, I wish you the best of luck," was a common refrain in therapists' voicemail messages. As for Natalie Dunnege: After seven rejections, she gave up looking. "It's hard when you're feeling sad and you feel like you can barely keep things together," she says. "It just seemed like way too much at the time." Mental health advocates, including Keith Humphreys, say limiting the number of therapists available to patients is actually a strategy for insurance companies. "It's a way to control cost," he says. While insurers are now required to keep an adequate number of clinicians listed in their directories, he adds, they still find ways to sidestep the rules. "You know, the law doesn't say you can't put people on there who are dead, or you can't put people on there who are not taking new patients," he says. "What that translates into, then, is people have to wait longer for care, which then cuts expenditures for the insurer and reduces access." California passed a law that went into effect July 1 — SB 137 — that requires insurers to make sure their physician directories are more accurate. The law was passed mainly in response to consumer concerns around finding primary care physicians and specialists covered by new Affordable Care Act plans, so a lot of questions remain about how the law will be enforced, especially when it comes to mental health providers, who are largely self-employed, solo practitioners. The insurance industry says it will be a challenge to comply with the new California law. "When you have networks as large as ours and you have as many enrollees as we have here in California, you're not going to be able to just have everything accurate every single second of every single day," says Charles Bacchi, CEO of the California Association of Health Plans. He said the industry is working to make it better. "But we also need to be realistic," he says. "We don't run a mental health provider's office. They do. And how they handle people calling their offices is their job." Blue Shield declined an interview. In a written statement, the company says it tries to make it easy for providers to update changes in their contact information and schedule. "We understand that there are a number of issues that impact a provider's availability to take new patients, such as administrative limitations and fluctuating numbers of patients based on their individual needs," the statement reads. "When those instances arise, the provider is required to notify us so that patients have access to the most up-to-date information about who is available in their area." The insurance industry also says it is facing another challenge: a nationwide shortage of mental health providers, further exacerbated by the millions of people who have signed up for insurance under the Affordable Care Act. In California, there are "around 4 to 5 million more people with coverage — just in the last two years," Bacchi says. "And that's creating a strain for everybody — plans and mental health providers." Meanwhile, people like Natalie Dunnege are toughing it out on their own. This story is part of NPR's reporting partnership with KQED and Kaiser Health News.